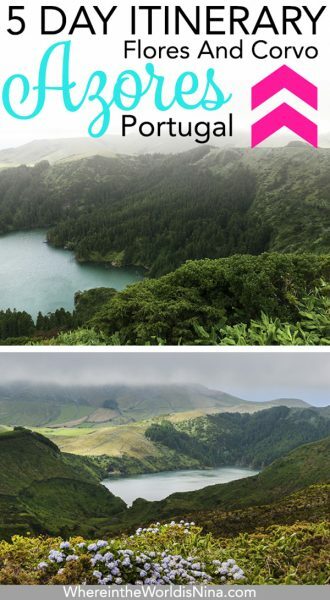 This Azores itinerary is a guest post from Sandra. 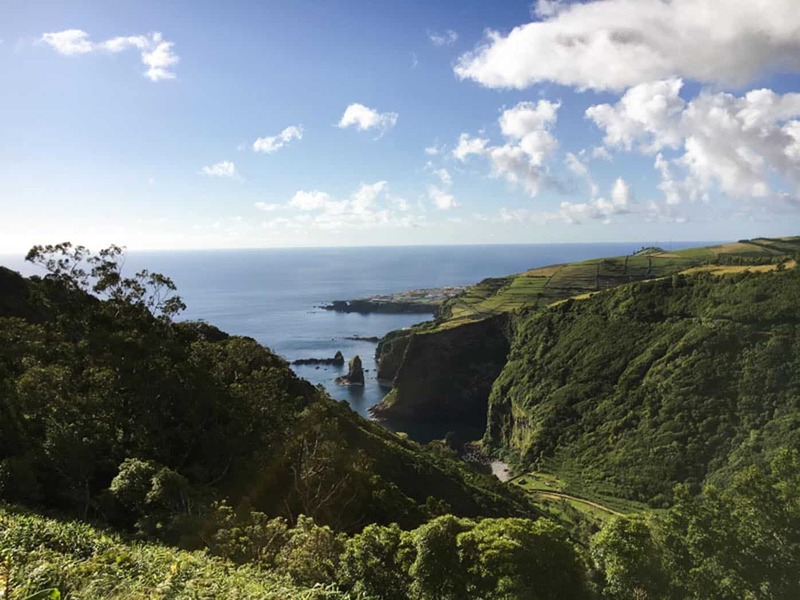 I believe most people think that one week in the Azores is more than enough but as an Azorean writer, I can tell you how far from true that really is. But then again, there isn’t much to do besides strolling through cow-filled green-pastures and gazing at the North Atlantic Ocean scouting for whales, right? Wrong! Attempting to plan a one-size-fits-all itinerary for all the islands is out of the question because each island is so different that it vastly depends on what you dream of doing in the Azores (and I don’t mean doing what everyone thinks you should be doing). That’s why I focused on two islands, in particular, Flores and Corvo – my two homes and both UNESCO Biosphere Reserves. But before diving into my Azores itinerary tips for you, let’s take care of some of the logistics. The biggest airport in the Azores (Ponta Delgada in São Miguel) is one four-hour-flight away from Boston and one two-hour-flight away from Lisbon. For years, Azores Airline (the official Azorean airline) dominated the airspace and operated all flights from mainland Portugal and from Canada and the USA to the islands (both North American countries have a large population of Azorean immigrants, especially on the East Coast). But plans to increase tourism to the region demanded a new plan and budget flights are now available. If you’re keen on a boat trip as a means of getting to the Azores, there are regular connections between islands during the summer but I’d only recommend it for trips under one hour (flying may be the least scenic option, but it’s still the fastest in most cases). 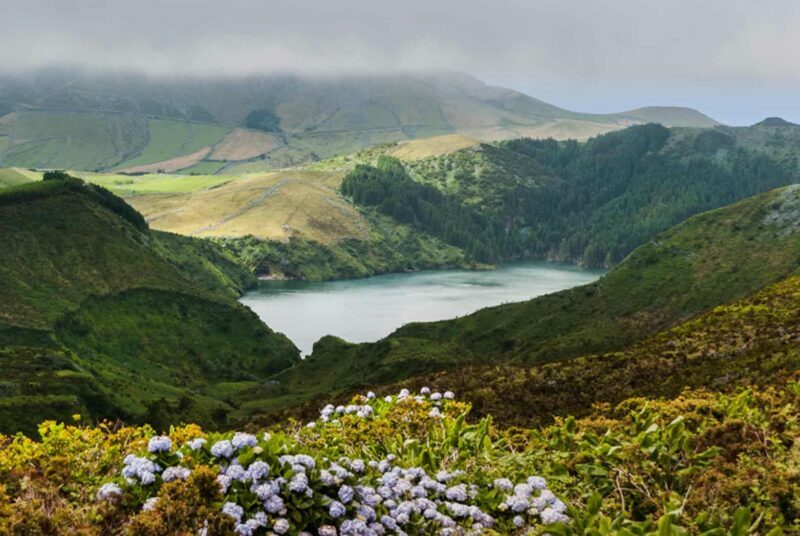 Take a gander at all the beautiful lagoons around you on this Azores itinerary. The nine Portuguese islands are a dream destination for nature lovers but I believe that anyone with an adventurous spirit would want to travel there and see what the fuss is all about. Even though it takes some adjustment to spend time in such a remote location, everything you see is so incredibly unique that you’ll never feel bored. If you’re on a budget or not sure what your tolerance level is for off-the-beaten-path, São Miguel is ideal to just get that little whiff of island life, including breathtaking landscapes, of course! 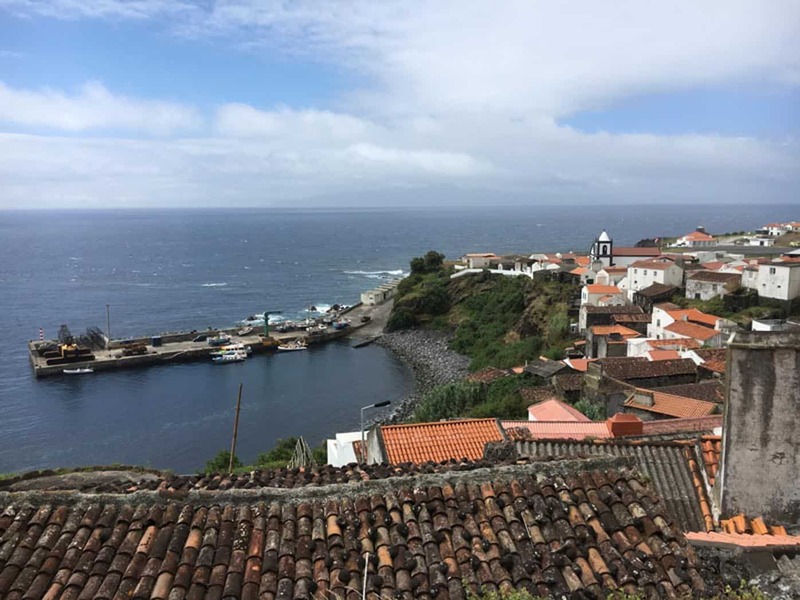 Faial, Pico, and São Jorge are the perfect islands for travelers who want to see the most in a short time since island hopping here are the easiest. There are regular ferry boat connections between all three islands all year round (in fact, plenty of people live in Pico and commute to work in Faial during the week). Terceira is what we call the cultural island. Travelers who choose this as their destination either have relatives there, go to attend a very specific cultural event or are striking UNESCO World Heritage Sites off their bucket lists. 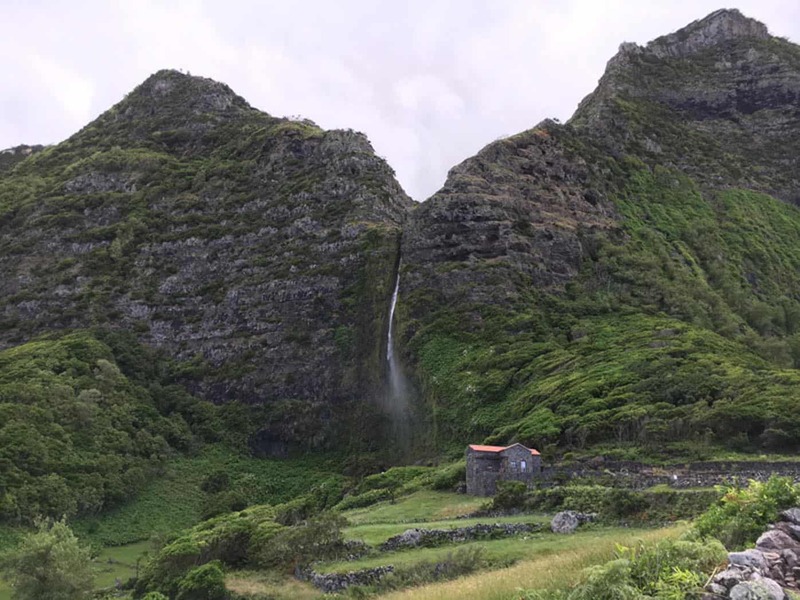 If you want some off beat things to do in the Azores, Graciosa, Santa Maria, Flores, and Corvo are the ultimate islands, where you won’t see that many tourists (compared to the other five islands). But where it also takes a fair dose of patience and travel planning skills. Oh, and all of them are a foodies paradise but that would be a whole other post. For inspiration, take the word of foodie master himself, Anthony Bourdain. 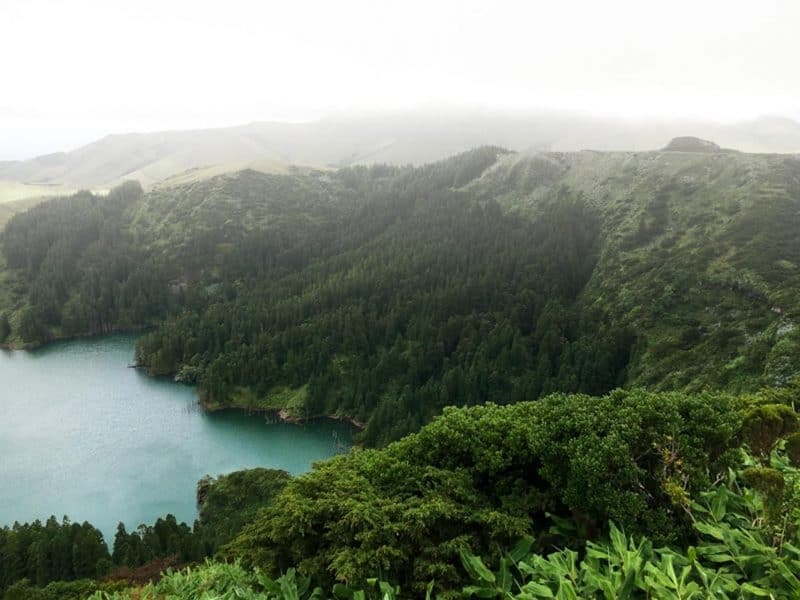 The Lagoa do Fogo on São Miguel. 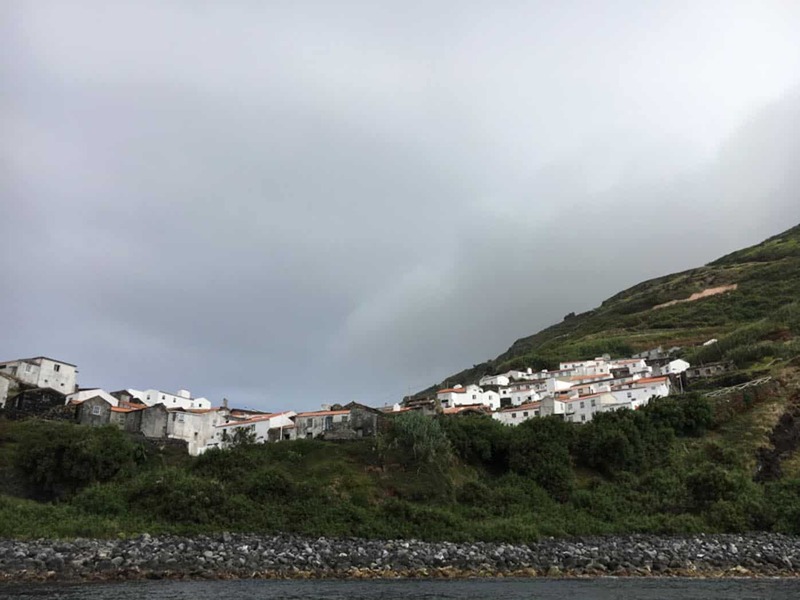 Telling you that three days in Flores, Azores is more than enough is tricky (and, yet, most people will say that it’s more than enough to visit the 55.25 square-mile island). On a first introduction to the island, yes, I believe three days is plenty of time to see everything. In reality, if you were pressed for time and were lucky enough to have one full day of perfect weather conditions, one day would be enough to see the whole island. For this particular itinerary, I suggest you rent your own car – public transportation on the island is unreliable and hiring a taxi or a guide takes away from the hands-on experience. Besides, there’s only one main road going around the island a few secondary ones leading to the must-see spots, so getting around by yourself is pretty straightforward. 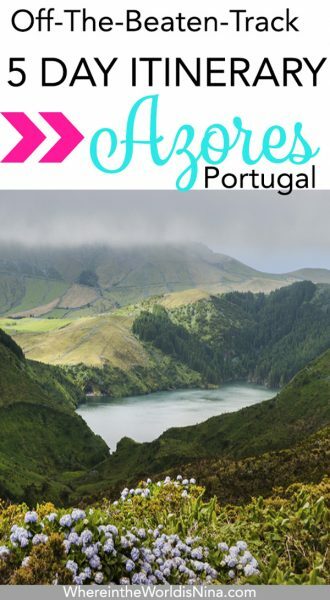 I’m including two days with must-see spots and one free day where you can chill by the ocean, go for a swim, explore one of the hiking trails or simply wait for better weather if you were out of luck on one of the sightseeing days (weather forecasts in the Azores are always challenging, to say the least). Cedros bay view—one of the many epic things to see on your Azores itinerary. The rivalry between the two counties in Flores Island is serious, to the point that locals joke about how Lajes is Spain and Santa Cruz is Portugal (the latter being better than the first, of course). Private jokes aside, the Lajes county concentrates most of the Instagrammable landscapes people travel this far to see: the only sand beach you’ll find on the island (in the town of Lajes), a locals’ favorite summer vacation getaway (Fajã Grande), the unique volcanic rock formation Rocha dos Bordões, unreachable waterfalls (except one, where you can actually swim), and all the eight lagoons. For lunch, head over to Papadiamandis at the Fajã Grande beach area (great for the view and the fresh fish) and for dinner, make a reservation at Pôr do Sol (typical local cuisine with a view to the most beautiful sunset in the world, after which the owners named the restaurant). Poça das Patas – some call it the 8th lagoon but not of volcanic origin. This lake is the result of dozens of waterfalls streaming down luscious-green slopes. It takes a bit of hiking to get there, but it’s worth it. Fajã Grande beach – if you’re looking for a more resort-like beach (although, technically, this is not a beach) where you can choose to swim or just drop by to have a couple of cold drinks in the sun, at the nearby bar and café. This beautiful waterfall at Poco Bacalhau is a must to include on your Flores itinerary. Santa Cruz County may lack impressive lagoons and waterfalls but it compensates in mesmerizing deep-blue-ocean bays, views to the neighboring island of Corvo from anywhere in the Northeast coast, pirate-story-worthy caves, a forest reserve with resident wild animals (such as deer and peacocks), and my favorite lighthouse in the whole island. With the end of the whale hunting industry in the late 1980s, the existing ͞whale factory (where hunters butchered sperm whales and prepared them for export) was abandoned and falling apart until a few years ago when it became necessary to include that gruesome part of History in the local heritage. Head over to Sereia and ask what’s the catch of the day if you’re looking for a fresh fish meal. If you’d like more options, check out the Hotel Servi-Flor restaurant that serves outside customers as well as hotel guests. Most restaurants in Santa Cruz need a reservation first. Fábrica da Baleia do Boqueirão – the Whaling Museum is set in the former “factory” where whale hunters chopped down whales (there’s no pretty way to say this, sorry) for oil and fat to transform into everything from soap to medicine, and export. For years, this was part of the island’s economy. Today, it’s part of its heritage and History. Centro de Interpretação Ambiental do Boqueirão – the Environmental Interpretation Center is meant to blow your mind with everything there is to know about the island’s fauna and flora. Who knew one tiny island in the middle of the North Atlantic Ocean could be this rich? 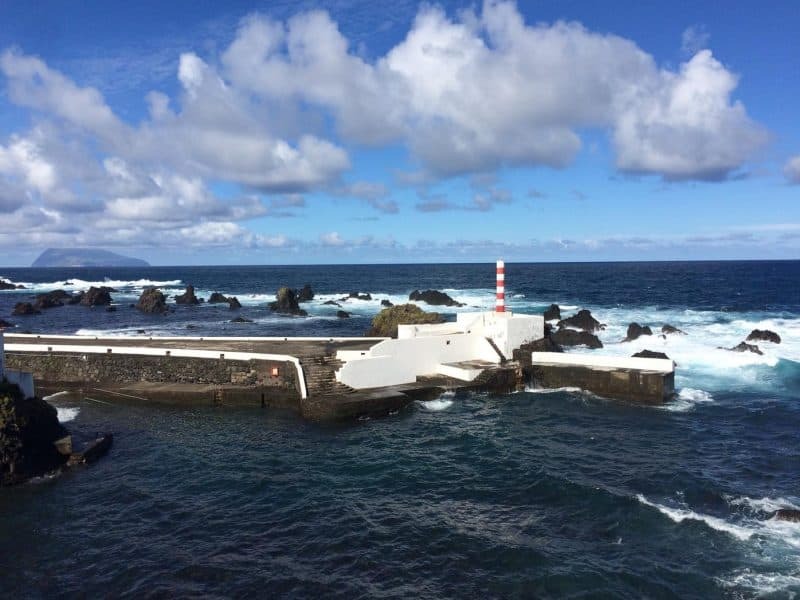 Fajã do Conde – for the adventurous, hike all the way down for a semi-secluded swim. For the least adventurous, the view from the top is quite enchanting too. A “fajã” is like a piece of land that resulted of a landslide, probably during one of the island’s eruptions during its formation. As far as I know, there is no translation into English. Forest Reserve of Fazenda de Santa Cruz – if you have time for a picnic or a barbecue, this is the spot. But you can just visit to see the resident animals. Monte das Cruzes – the best spot to view the whole of Santa Cruz town from the top. 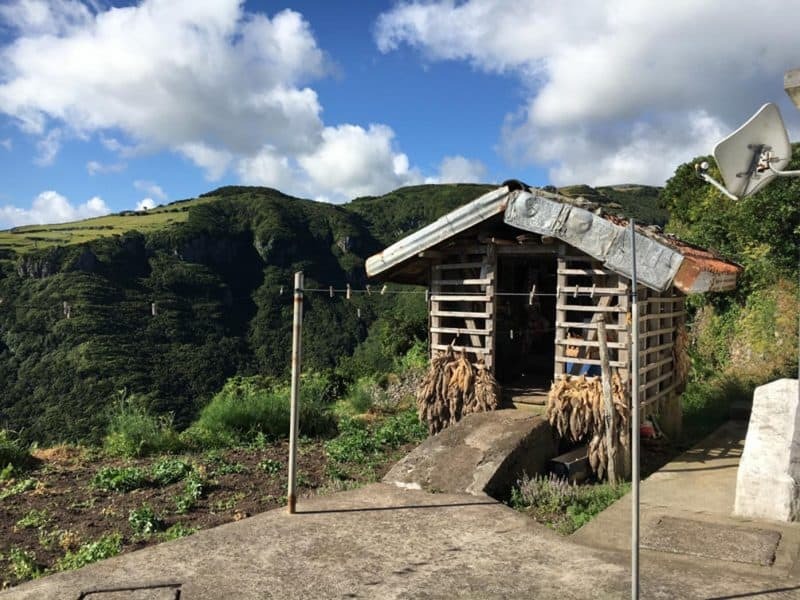 Ponta Ruiva – a small village where locals set up a typical house (as it was back in the day) so that tourists can see old farming tools, the cast-iron cauldrons where people used to cook, and basically how a house used to look like. Ponta de Albernaz lighthouse – at the village of Ponta Delgada, in the North, you will find the most beautiful and Instagrammable lighthouse on the island. ↠ Insider Tip: At Ponta Ruiva ask around to visit the replica of a typical house. The lady who welcomes you usually offers a shot of one of her homemade berry liquor (either blackberry or a local fruit called araçá (I have no idea what the English translation for this would be). Be mindful, especially if you’re driving, that it is a sweet and strong drink. The Azores are famous for whale watching but, since Flores island is not on the usual route of migrating whales, actually seeing one here is rare (and chances are it got lost from its herd). Islanders here do what Islanders do best wherever they are in the world: they adapt and they make use of what they have. So, the top outdoor activities in Flores is hiking (there are five mapped hiking trails, classified according to duration and level of difficulty) and canyoning (making use of the abundance of caves and waterfalls). If you’re not that into outdoor activities and if you were lucky enough with your previous sightseeing trips, take the day to wind down at the swimming spot that caught your eye (Ponta Delgada bay, the natural swimming pools in Santa Cruz, the beach in Lajes, the always-sunny and warm Fajã Grande) or go back to that one place where the view really took your breath away for one last look before hopping on the boat to Corvo the next morning. Flores has one of the best hotels in the Azores that isn’t actually a hotel. Aldeia da Cuada is a remote eco-tourism village (the first of its kind in Portugal) set in old abandoned houses that emigrants to the USA left behind, hoping to return home one day. At that time, as soon as they got clearance to enter the country, people would literally pack and leave. Each one of the 16 houses are named after their previous owner, paying tribute to the community that once lived there. If you need an option closer to the airport and not as secluded, you can choose one of Santa Cruz das Flores’ three hotels: Hotel das Flores – Fundação INATEL, Hotel Ocidental, and Hotel Servi-Flor. You made it to Corvo, Azores! Corvo is the smallest island in the archipelago, with a little over six square miles and 430 people living in one tiny village—the only one in the whole island. Just stepping foot on the island is a one-of-a-kind experience and if you’re looking at photos of Corvo right now you’re wondering why am I suggesting you spend two days there when a morning would probably be enough… Well, Corvo Island is not about beautiful landscapes and sightseeing (in fact, there isn’t much to see when compared to the other islands). It’s all about that unique experience of remote islander life that will put a lot of things we take for granted into perspective. Speedy-fast internet connection makes you feel a little less isolated from the world (in case you’re overwhelmed) and still offers plenty of opportunities to make your Facebook friends jealous. 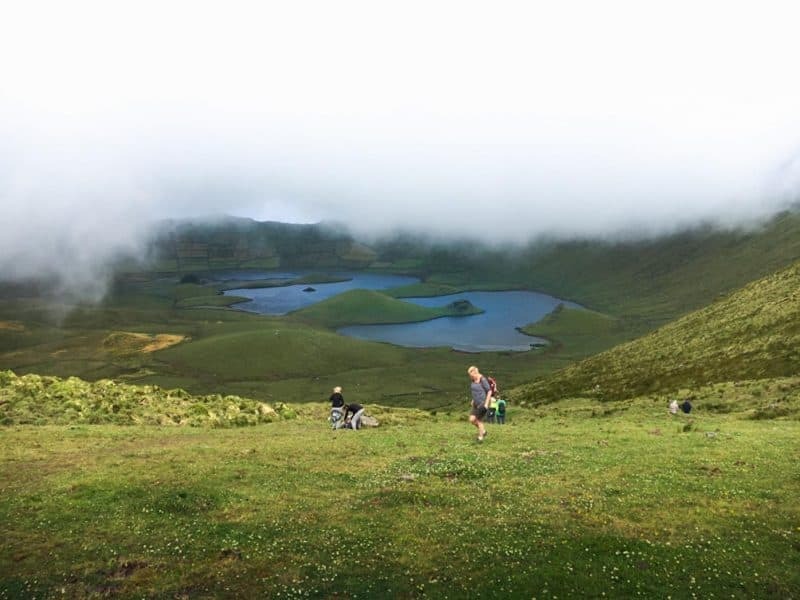 Caldeirao Lagoon at Corvo is one of the best things to do in the Azores. Even if you just reached Corvo Island from Flores, you’ll still have plenty of time to explore. Corvo doesn’t have buses and taxis so you either walk and hitchhike (there are plenty of farmers willing to help you out on their way to their daily duties) or you ask Kathy at the hotel to show you around. I know the list of must-sees isn’t huge and it’s borderline disappointing, but Corvo is not about just the sights. It’s about silence, the atmosphere, the people, the damn good milk and cheese (those cows eat nothing else but grass). The whole island is an experience and I always explain this so people don’t look at the list and go meh, that’s it? Caldeirão – the only lagoon on the island. Locals claim that the little hills in the middle of the water resemble each one of the nine islands. Hiking trails – Corvo doesn’t have that much area to cover, but there are still two mapped hiking trails on the island: Cara do Índio and Caldeirão (the trail goes around the lagoon). My favorite (although unmapped and not considered an official trail) is the road that goes from the village all the way up to Caldeirão – locals will salute you even if they don’t know you (and you should salute back; it’s as simple as raising your hand in return). I couldn’t think of a better farewell to the most remote island in the Azores than spending a good chunk of time strolling through the narrow streets of Vila do Corvo and mingle with the locals a little. Corvinos’ lives have always been harsher than other Azores islanders. Seeing this village from the sea is one of the best things to do in Azores! The distance, the isolation, the vulnerability of their location. Out of all the things to do in the Azores, this might be the most humbling. I feel a sense of community here that I’ve had trouble finding elsewhere. I remember the days when Corvo was so off the map, that building hotels on the island were not on the priority list. In the beginning, the only tourists visiting the island had relatives and friends they could stay at or were just on a day trip from Flores. Well, there aren’t actually hotels on the island (that would be a foolish and unsustainable decision) but there are a few small guesthouses to choose from. My top pick is Guest House Comodoro, a family-owned establishment with 14 double bedrooms that includes complimentary breakfast (all with local products, some of them homemade by the owners). The family lived in the US for many years so they speak English fluently. They also know the island like the back of their hands and Kathy Rita (the owners’ older daughter and hotel manager) will go out of her way to make sure you don’t miss a thing. 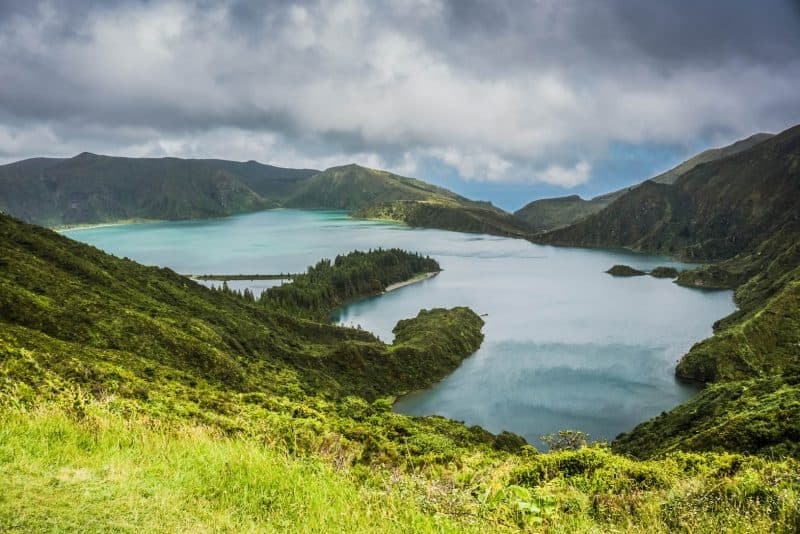 The Azores will take your breath away but these two islands, in particular, will make for a special visit due to their small size and remoteness. While others flock to the more popular islands, these two certainly deserve a visit as well! What’s most exciting for you on this Azores itinerary? Let us know when you’re going! Sandra Henriques Gajjar is a freelance web content writer born in the Azores and currently based in Lisbon. 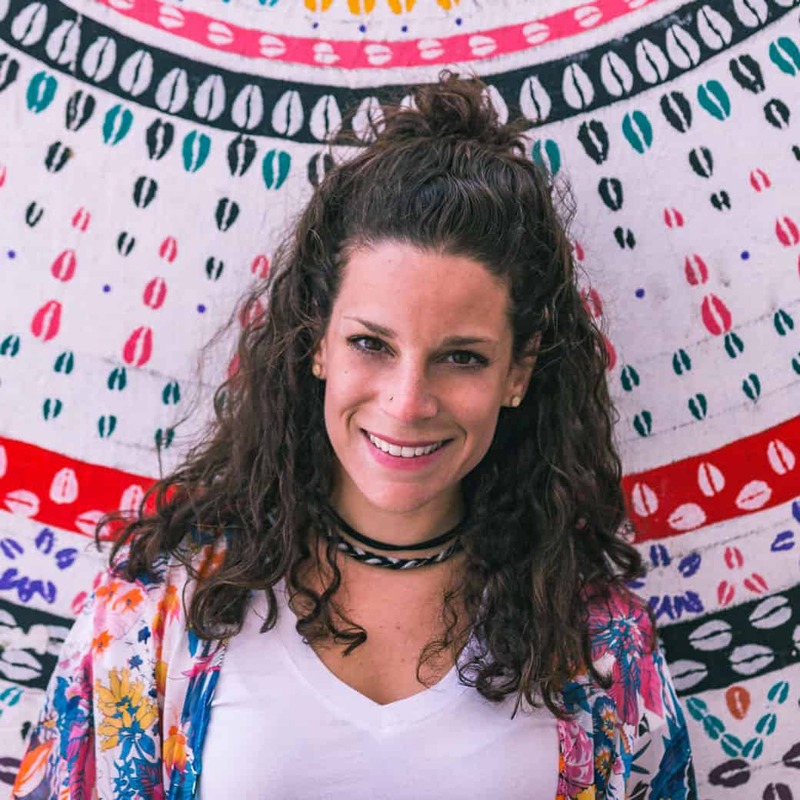 Since 2014 she’s been blogging about travel, culture, and the people she meets in between at Tripper, a blog about sustainable cultural tourism. Don’t lose this! Click the picture and pin for later. Thanks for the summary. I’m spending 3 weeks in the Azores from April to May, and I’m most excited about Flores and Corvo. Despite what you say, I’ll probably spend 6 days between the two. 🙂 I’m sure I could sit and stare at some of the scenes all day, and allowing extra time in case of bad weather seems a good idea. Thanks for this, you’re clearly a seasoned traveller. We enjoyed this.